So, yes, nothing in Dragon Eyes has the unexpected gravitas of Dolph Lundgren's grasping regret in Regeneration, but as a straight-ahead action movie, Hyams is still a director to watch. He loves his big, open spaces, making even Tiano's cell back in the prison large enough to almost seem cozy. The confrontation that closes the second act occurs in a darkened warehouse that seems to stretch into inky blackness so deep the area almost recalls the matte-painted infinity of the warehouse at the end of Raiders of the Lost Ark. Over time, even the excessive color grading—which washes sunny exteriors in spray-tanned bronze and Mr. V's seedy deals in avaricious green—come to fit their settings. But the real draw is, of course, the action, which Hyams continues to film in such a way as to elicit thoughts of the genre's 1980s heyday even as he puts his own imprint on the genre. Hyams' sequences do not lack the rapid-fire editing and hand-held, close-up framing that defines so much action filmmaking today. He merely uses the technique as punctuation, not the whole damn sentence. This allows Hyams to use "chaos cinema" flourishes as they are intended, to provide real-time flow between thought, action and result that can actually make a fight more fluid, not less. One slick movie—Hong disarming one thug, ejecting the clip and throwing the empty gun at another—is performed so swiftly that its comic principles take an additional second to catch up to what happened, yet the smaller movements performed in his maneuver are clearly shot enough to give the joke the clarity it needs to be funny at all. On the flip side, Hyams also includes an extended take Steadicam sequence that serves as a reminder of his capable skills as a choreographer. 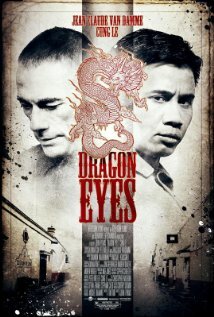 Dragon Eyes betrays its DTV financing and lowered expectations in a way that Regeneration never did, yet such phenomenal action staging continues to stretch the boundaries and assumed worth of that format. In fact, though this is the lesser film of Hyams' last two efforts, it may be better at demonstrating the kind of spontaneity and low-scale creative freedom DTV, VOD and the like could afford genre filmmakers who don't need $100 million worth of effects to cover up their mediocrity. Nevertheless, it is hard not to imagine what Hyams might do if he actually got his hands on a $50 million budget, rather than making movies that look like he received $50 million instead of 10-15.